A Battle Cry for Anthony’s Newly Acquired Ninjas. 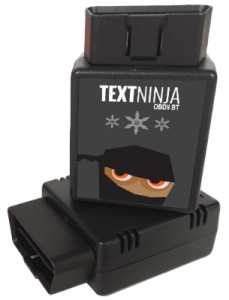 When we first learned of TextNinja, the name had us picturing a band of Ninja’s stealthily emerging to slap distracted drivers out of their senselessness. While it was initially disappointing to learn this was not their exact vision, we were pleasantly surprised in all other areas! What is TextNinja and Why is it Fun? TextNinja is a gamified driving app that incentives users to drive distraction-free with badges and other perks. The app prevents phone-related distractions from sounding while you drive, thus silencing distractions before they strike. Safe driving habits are rewarded over time in a fun way, with the ultimate goal being to receive a TextNinja Black Belt – the most coveted belt reward of them all! Future plans include a network of partners that offer physical rewards and perks for being a safe driver. 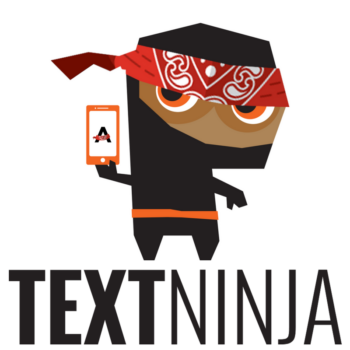 TextNinja App Users can also mobilize an army of ninjas engage the customizable auto-reply feature to let friends know they’re practicing safe-driving habits. The gold standard of ambition for many traffic-safety related organizations, APB Foundation included, is to prevent the loss of life. But, just how does one go about measuring the impact of a revolution? Certainly, awareness efforts bring attention to a subject, but what does that attention equal? Will we REALLY ever know the true success of our efforts? 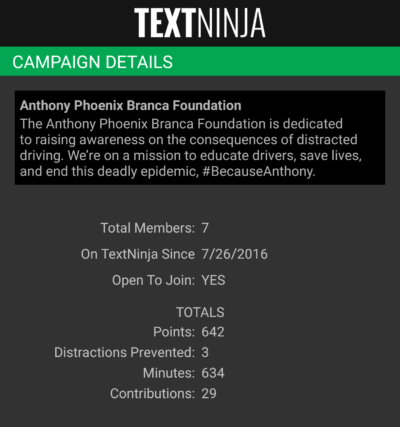 TextNinja provides organizations such as the Anthony Phoenix Branca Foundation with the ability to quantify the impact their awareness campaign has in real terms. By logging the number of distractions the TextNinja app has prevented and correlating that information against the number of miles a user has driven, the awesome people over at TextNinja are working on a way to statistically prove the act of “saving a life”. While our mindset has always been to believe we have saved “at least one life” through the power of Anthony’s Story, what if we could prove saving two? Or even thousands? Now that is next-level cool! TextNinja pairs your car to your phone using a Connected Car adapter. While the Connected Car adapter is not required if you use an Android device, pairing the adapter increases accuracy in the TextNinja Defense process. Fear not, young warrior - Ninja’s will still protect you if you’re an Apple User! There is a small Ninja Warrior Sword Shining Fee of $29 to purchase the OBDII Bluetooth Connected Car adapter. For the short term, Apple users will need to purchase this device to pair their phones to the TextNinja App. Shop here! As a small startup on a mission to save lives, TextNinja uses proceeds from device sales to fund anti-texting & driving initiatives and develop free tools that empower other organizations. Whether you’re battling to defeat a texting & driving addiction, or are already a decorated solider in the Bandana Army – this app is for you! Get rewarded for making smart decisions behind the wheel.